When it comes to sports betting analytics, historical odds data is power! With our Bet Labs Software, you can instantly analyze years of archived sports betting data, including line, spread and odds history. Create your own winning sports betting database system in minutes, not months. Bet Labs allows users to mix and match over 45 different filters, and apply them to historical odds data going back to 2003. Quickly and easily find betting trends and stats that have been profitable over time. We provide data for the six major US sports. You can get MLB, NFL, NHL, NBA, College Football and NCAA Basketball odds history! 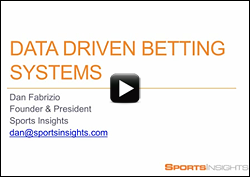 Watch our video webinar on how to build data driven NFL betting systems using Bet Labs. Learn about the impact of big data on sports betting, data mining best practices, and how to obtain sports data useful in making bets.